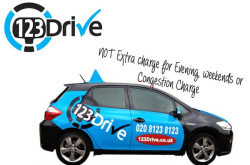 123 Drive driving school provide affordable automatic or manual driving lessons in South East London. DSA approved driving instructors. 123 Drive driving school covers postcodes in London including SE1, SE5, SE11, SE15, SE16, SE17, SE22, SE24, SW2, SW4, SW8 and SW9. (Monday to Friday from 8.00am to 8pm, Weekends 9am to 5pm). Email : info[at]123Drive.co.uk or fill website form.